Each year, heart disease kills more people than cancer. Patients are treated by a variety of specialists and primary care practitioners, depending on the organ system involved. 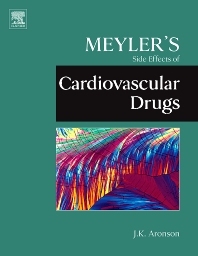 This volume enables practitioners to assess the adverse effects of the complete range of drugs used in cardiovascular medicine, including antihypertensive drugs, and drugs used in the treatment of heart failure, angina, angina pectoris, and cardiac arrhythmia and enable practitioners to prescribe preventative treatments with medications such as blood pressure reducers, aspirin, and cholesterol-lowering drugs, as well as drugs used for more aggressive therapy. This volume is critical for any health professional involved in the administration of cardiovascular mediations.